I regularly talk with all sorts about employment opportunities on the Salesforce platform. It is clear to me now that it can be very challenging to define exactly what youâ€™re looking for as a prospective employer. The key here is that an administrator is not responsible for configuration of new functionality and generally speaking does not need to have a strong knowledge of integrations and other downstream impacts. An architect has to understand the basics of administration at a minimum. I often think of solutions architecture as a progression from an administration, but that could be because it was my own. a) The term â€œclick-to-configure developerâ€ â€“ it really is great marketing, but does confuse titles. This confusion is exacerbated by certifications: certified developer and certified advanced developer are starkly contrast in expertise required. A certified developer is someone who understand the basics of code and can write a vf page with a standard controller, while a certified advanced developer can necessarily write apex/vf custom controllers. A certified developer is more akin to a certified administrator than to a certified advanced developer. b) Generalist developers. 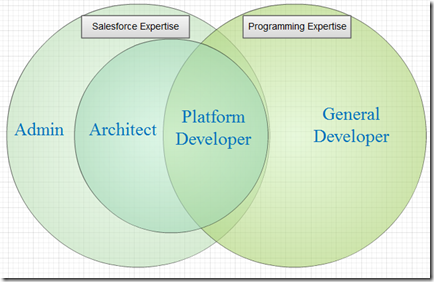 There are a ton of folks out there that understand code and have written bits of code on the Salesforce platform. There is huge distinction between someone who has actively learned the Salesforce platform (including administration, apex, vf, limits, bulk apex, best practices, etc.) versus a generalist developer who has learned just enough combined with their prior OOP experience to code a trigger. 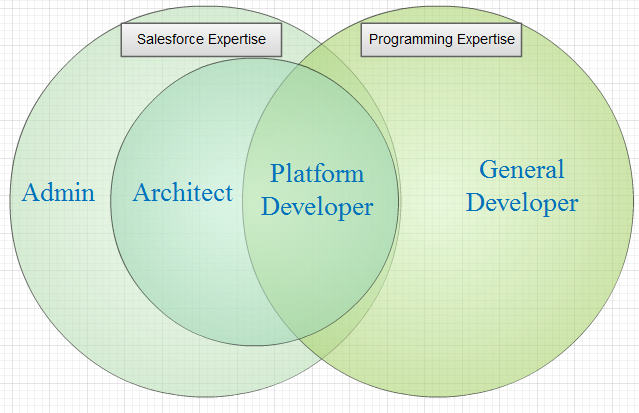 For lack of better terms Iâ€™ll call the first a Platform Developer and the latter a General Developer. Cheers @chrisodavies for the conversation last night that sparked this post. Do you agree with my classifications? Would you refer to these roles as anything different? Note: there are other roles (QA, deployment experts, etc.) that I have not included in this conversation but are quite valuable as well.